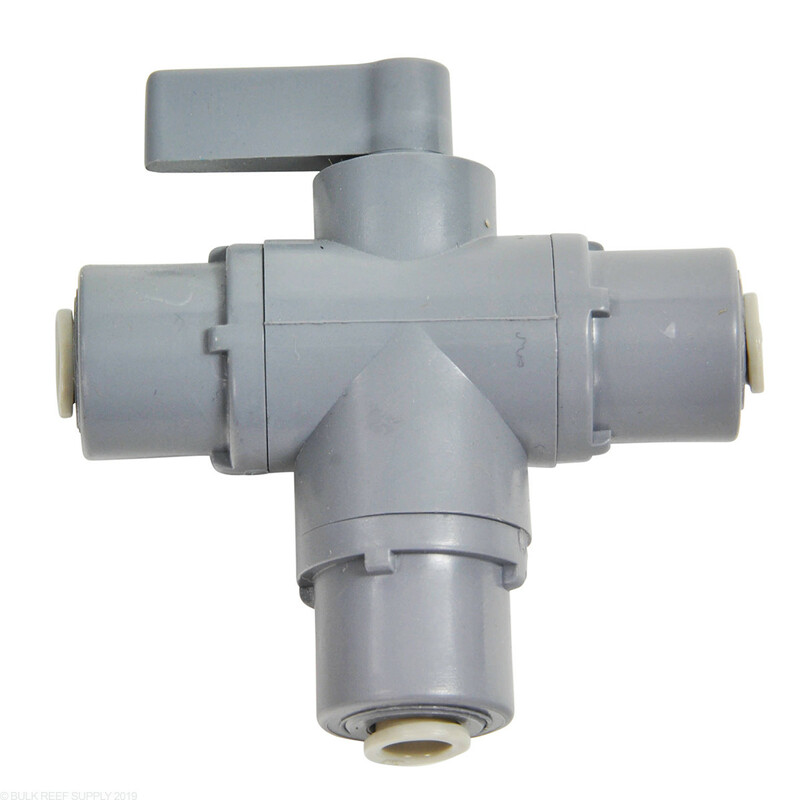 The 3-way ball valve is probably one of our most favorite fittings. By swinging the handle from one side to another, you can either turn water flow off completely, or direct it from one direction to another. They work great for fresh and saltwater storage containers, and give you control of when the container fills back up. Three way ball valve with John Guest 1/4" push connect fitting. This is a must have for a six stage ro/di. It's made of quality material. Bought this valve to have the option of making RO for drinking or RODI water for my reef. Install was a breeze and the quality is actually more than I expected. Solid stiurdy valve that I'm sure I'll get many yes if use from. Simple and effective, no problems whatsoever. Used on an apex dos doing waterchanges to be able to calibrate dos without removing my RO lines. 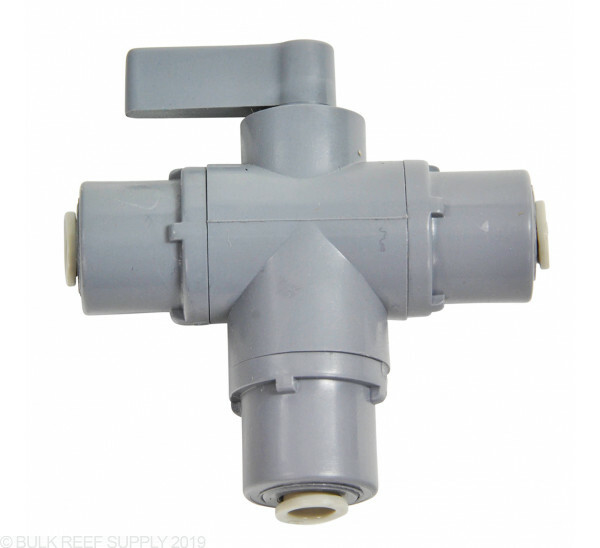 Added this 3 way valve to direct the RO water to either salt-water or fresh-water bins. Quick and easy hookup to the 1/4" tubing, and works as expected. Great product. I use this to drain the high TDS water before my DI cartridge when I first start my RO system. Sure beats using a "T" and two valves. It seems really nice. I wouldn't be surprised if it lasts forever. Using this to split my RO/DI water into a fresh and saltwater holding barrel. Went to Home Depot since I wanted it fast and they had nothing (unless you want to pay about $30 to rig a bunch of stuff to work) Ordered from BRS and was delivered within a couple of days. Fast and efficient. Highly recommend. Easy to use. Easy to install. I use it to divert RO/DI water from my salt mixing station to my RO/DI storage container and back again. This valve allows me to run through my di fir my reef tank or ro only for my kids crayfish tank and ro drinking water to my sink. I may be doing something wrong, but it's seeming more that I have a faulty unit... water will only come out the bottom... first thought the DI was the problem, but tested the main line of the "tee" by disconnecting it from the DI and have the same problem. Would like to know if anyone else came across this and if there's something I need to do differently. Thanks... I gave it a three because I had to pick a star... hope to be saying five stars once I figure this out. I got this to work with my RODI system, to switch between drinking and tank water. It is well built and easy to install. I have no doubt this will last a long time. I mainly got this valve to divert product water line when flushing the system instead of burning through resin when flushing the system. If you going to do the same as I did I would recommend by an RO tube divider to connect your waste water with the diverted product line so when flushing the system there isn't two separate lines being used and it's a lot more neat and tidy. I read reviews how this can prevent using up all the DI prematurely on start up and when back flushing the RO membrane. Where in the line does this normally get installed? The first bit of water that comes out of an RO membrane when it starts has a higher level of TDS (called TDS creep). People use this valve on the line between the RO membrane and the DI resin so that they can divert off that first gallon or two of higher TDS water. How do I release a line that I've inserted into the valve? I have included a link to our instruction page below. In short you will hold down the murlok toothed gasket (part of the fitting that moves) With one hand or thumb and pull and twist the tubing out like with a finger trap. Feel free to let us know if you have any further questions! Hello! What's the correct way to install and use this? I seem to only be getting water out the bottom part of the tee, and not the right side - so I'm not sure which direction the handle on the top should face, and which side should have the output from the carbon block to my DI resin. The DI resin canister doesn't seem to fill up with any water no matter which way I turn that handle. I feel like it should be a simple install and the fact it isn't working for me is driving me nuts! Not a problem at all! Actually you want to plumb your incoming water line to the bottom of the Tee (opposite of the handle). With water coming in from the bottom, you can use the handle to divert water to either the left or the right of the Tee by pointing the handle towards that side. :) Hope this helps. I have the 4 stage Value RO/DI unit. I was wondering, would I need this if I wanted to split the blue water line. So that when I wanted to make RO/DI water for top-off, then flip the switch for when I wanted to make RO/DI water for my saltwater tank. Connect this to the end of the blue water line, then connect the tubing to branch off to the respective tanks. Is this what I would need? Thanks. You wouldn't need this valve specifically but it would be a good option. Otherwise you could use a tee and a pair of inline ball valves (one for each line) as well.